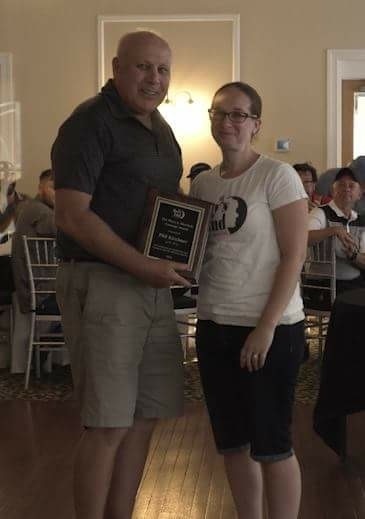 Mary’s Fund charity recently honored Flaster Greenberg shareholder Phil Kirchner with the Mary J. Sherlack Courage Award during the Fourth Annual SJ Mary’s Fund Golf Tournament held at the Valleybrook County Club in Washington Township, New Jersey. The award is given to select individuals each year for their exceptional acts of kindness and courage in the face of great adversity. Phil is a member of the firm's Litigation Department and a former managing shareholder of the firm and past chair of its Litigation Department. He concentrates his practice on resolving business disputes, including complex litigation of all types of business issues in both federal and state courts, primarily in New Jersey and Pennsylvania. ABOUT MARY’S FUND: On December 14, 2012, Mary Joy Sherlach, school psychologist at Sandy Hook Elementary School in Connecticut, gave her life to protect the students she served. Her family and friends created Mary’s Fund to honor her legacy and continue her important work. The mission of the fund is to support programs that aid the mental and social wellness of children and adolescents as Mary did in her day-to-day life. Initially created in Fairfield County, Connecticut, the New Jersey chapter supports local mental health charities such as the Mental Health Association in Southwestern New Jersey. The New Jersey chapter of Mary’s Fund was envisioned by South Jersey residents Maura and Eric Schwartz. Maura is one of Mary’s two daughters. Maura and Eric have a vested interest in the psychological health of children and adolescents and want to continue Mary’s life work. For more information, or to donate, click here.